Search area includes counties of Lee, Charlotte, Collier and Hendry. (Beaches included: Fort Myers Beach, Bonita, Marco, Naples, Barefoot, Vanderbilt, Englewood etc. Locations outside these areas/counties like West Palm to Miami and South Beach can possibly be arranged. A minimum trip fee of $25 is charged to cover cost of fuel. This fee is charged even if the lost item is not recovered. My interest in metal detecting started in Indiana. My wife and I lived around several fresh-water lakes where summer tourists like to boat, swim and fish. Several pieces of jewelry, keepsakes and cell phones were recovered. Since then we have been "hooked" on this hobby. 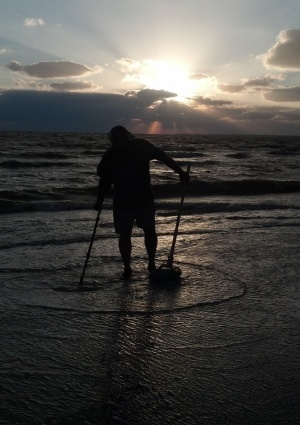 Over three years ago we moved to Florida and have continued metal detecting and is a hobby we enjoy doing together--especially beach/water hunting. Most times we will look for your lost item together which will double the chances of recovering it--two for the price of one! Between the two of us, we have four metal detectors--Minelab and Whites, so we have the proper tools for any situation. We are self-employed and most times can be available on short notice. Time is of the essence as Flordia beaches are heavily detected. A detectorist may find your lost item without knowing the rightful owner and keep or sell for scrap. We truly love recovering lost items for their rightful owners. We will help in any way we can and are happy to answer any questions you may have. If we don't answer your call, please leave a message and we will call back as soon as possible. We work around loud machines and don't always hear phone ring. 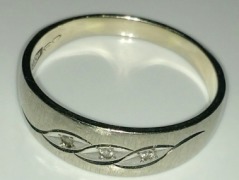 I lost my platinum wedding band in the ocean at Ft. Myers beach on February 17, 2019. We were throwing a football in the water and I didn't even realize that the ring had slipped off my finger and frankly, I didn't know if it was in the water or on the beach and I was crushed after looking and calling everyplace we had been that entire day. I ran across Craig Ostendorf on the internet while attempting to rent a metal detector on February 19th. Craig and his wife met me out on the beach that afternoon. Craig told me that he felt the chances of finding my ring were good, though I thought finding that ring in that big ocean after two days was impossible. Long story short Craig and his wife marched out into the surf with their equipment to give it a shot. 30 minutes later they found my ring and I cannot Express the relief and gratitude that I feel for what Craig and his beautiful wife did for me. I would highly recommend these angels for what they did for me, and they accepted a tip from me but didn't charge for their services. I thank you both from the bottom of my heart and I'll sleep better tonight with my wedding band back on my finger. 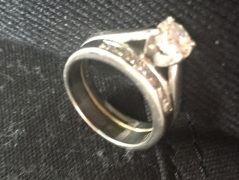 Please see the photo of my ring, and again thank you both for what you did for me. “My dad now has quite the memory of his first vacation in 14 years. . . 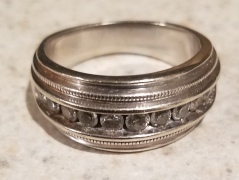 It turns out, while we were in Florida, my dad lost his wedding ring in the Gulf of Mexico at one of mine and Eric’s favorite beaches on Captiva Island. He didn’t realize he lost it until halfway through our trip. While trying to figure out where he could have lost it, my helpful husband Eric decided to look through our camera to try to narrow down a ballpark time and location. We found we had a picture of him with the ring on before going into the ocean on our first day, and one of him right after coming out of the ocean, but without the ring on. Then, no more photos of him with the ring on after that. That was where we narrowed it down to losing it on our favorite beach on Captiva Island. I found a site called the TheRingFinders.com and on a whim called a nice man (Craig Ostendorf) who lives in the area. I asked him how good he was at finding rings in the Gulf of Mexico. He said he had a 95% success rate–we all kind of laughed. I told him the location of the beach where we figured my dad had lost the ring, and just a few hours later that evening, he texted me a photo and asked: “Look Familiar? “I contacted Craig and Stephanie after my prized class ring slid off my finger into the Gulf of Mexico at a Captiva Island beach. I was throwing a football with a family friend on October 1, 2016 when my ring slid off into the water. Myself and 3 others searched for an hour or so in the murky water and were unable to locate my ring. 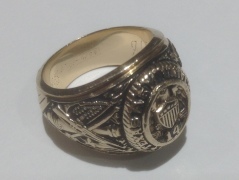 The ring was my class ring from Texas A&M University and was given to me by my mother before I moved away for work. The ring had an immense amount of sentimental value to me. I returned home to Texas on Monday and thought all hope was lost. Tuesday, October 3, 2016, I was talking with a co-worker about the incident and he said ‘Oh yeah, there is this site of people that will search for your lost rings’. I was initially hesitant, but I decided to take a chance and contact Craig. His response was immediate and professional. 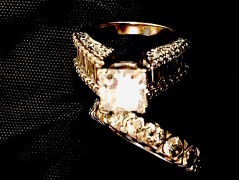 Within a few moments of talking with Craig, I realized that my ring would be searched for diligently and thoughtfully and my hesitations disappeared. Several hours later, I received a text from Craig with a picture of my ring! They had managed to recover my ring several days later in 3-4 feet of water! 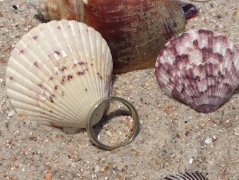 “I made the silly mistake of not removing my wedding ring when I went looking for sea shells in the ocean at Tarpon Bay beach on Sanibel Island. Within a minute or two of being in the water it had slipped off my finger. We were devastated especially as Sanibel was where we spent part of our honeymoon almost exactly 5 years ago. That evening my wife Emma googled how to find a lost ring in the ocean, she found a website created by a guy in Vancouver for just this sort of problem. It gave details of people in all different areas that specialize in finding items using metal detectors. I emailed Craig (at around 9pm) and within minutes he called me and arranged to meet me at the beach the following day. I meet Craig and his wife at the car park and they got their gear out and started looking. Just over an hour later Craig found my ring buried 7″ in the sand in around 3′ of water.